MCNARY DAM - Some small fish are making a big difference at McNary Dam. This week, researchers are using yearling chinook salmon to find the best way for fish to bypass the dam by sending them through different spillways to see which are safest. Tri-State Metal Fab of Spokane installed a $1.8 million temporary spillway weir into bay 20 two weeks ago. 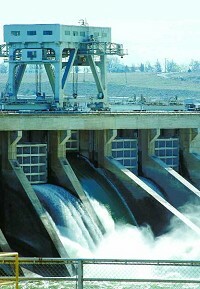 It allows juvenile salmon to pass through the dam along the surface of the water rather than through the deep spillways. "By providing a surface route, fish that are milling around will take the surface route," said Ann Setter, fisheries biologist with the Walla Walla office of the Army Corps of Engineers. "This allows them to stay in a surface layer and pass." The weir is one of two the Army Corps of Engineers plans to test at the dam. The second is simpler and less expensive, with an expected cost of about $693,000 and will be installed in bay 21 or 22 in the near future, after testing is complete. Researchers are determining the best place to install the next weir by sending four-inch long yearling chinook through different bypass systems, Setter said. Researchers are trying to find out which bay is safer for the fish, bay 21 or 22. The fish being sent through the dam act a bit like stuntmen. Researchers send them through the spillways and retrieve the fish afterwards to see how many are injured in the process of passing the dam. All the chinook must be retrieved because they are not native to the river. Setter said researchers keep them in holding tanks for 48 hours to make sure there are no lasting injuries from passing through the dam. Though the journey takes only a few hours, the process is involved for the fish. It starts in a building sitting atop McNary Dam, where researchers anesthetize the fish with clove oil so they can be tagged. Researchers pin on two inflatable balloons, one yellow and one orange, pin on a radio tag and insert a numbered tag behind the fish's eye. The radio allows researchers to track the chinook later by giving off regular chirps as they approach the receivers. The balloons use a chemical reaction catalyzed by water to inflate and bring the fish near the surface after they pass through the dam. The numbered tags are a backup way of identifying which fish is which. After each fish is ballooned, tagged and radioed, researchers drop them into freshwater buckets where the anesthesia wears off. After a few hours, researchers put the buckets on a wagon and wheel them over to the appropriate bay. Along with the fish, researchers send electronic "fish" through the dam. An electronic fish is shaped like a large roll of quarters with clear plastic encasing a mass of circuitry and sensors. Those sensors detect the depth and rotation the electronic fish goes through while traversing the dam. "It measures the forces the live fish are going through," said researcher Joanne Duncan with Pacific Northwest National Laboratories. Like the real fish, the electronic versions are tagged with balloons and radio receivers so researchers can retrieve them afterwards. For every 10 real fish sent through, one electronic fish also is sent. On Monday, researchers started a new rotation, sending 20 fish through six times in one day. Each time, researchers sent fish through a different tube leading to a different spillway. Each time a group of fish are sent, Setter said McNary employees open bays 19 through 22 to get enough water moving to simulate conditions of spring and summer runs when the dam lets water out from the upper to the lower side. On Monday morning, researchers wheeled the buckets of fish to bay 21. Next to the bay sat a white plastic tub with two long tubes reaching all the way down to the lower spillway. One of the tubes lets the chinook out 1.5 feet above the spillway crest and the other lets them out four feet above the spillway crest. Researchers are testing both over the next week to find what height works best. It takes the chinook about 15 minutes to traverse the raging waters of the dam, Setter said. After the spillways close, researchers head out in boats to retrieve the chinook on the lower side of the dam. They locate the fish with the radio signals and watch for the orange and yellow balloons. Using regular fishing nets, like the ones anglers use, researchers scoop up the fish and take them back to holding tanks for further observation. Setter said each fish is inspected for injury, both immediately afterwards and 48 hours later. Setter expects the Corps to decide whether the second weir will be installed in bay 21 or 22 by March 27. The overall goal, Setter said, is to get more fish through McNary Dam safely. "We would like to get more of those fish to pass the spillway in larger numbers," she said. Providing them a surface passage rout hopefully will accomplish that. Inside a Fake Fish on NY Times website in Java Script.